These forums have proven to be a great way for the Recollect Community to build networks between members of the community and share ideas and projects that have been made possible with Recollect sites. “It was really good to meet other users and learn how they are using Recollect. The forum also reinforced the commitment of NZMS to continuous improvement and I could see how developments from other sites (such as Uni Sydney) will benefit us.” Michael Smith, City of Sydney. The day began with an overview from our General Manager, Gavin Mitchell, who discussed the recent growth we have experienced and the future of the Recollect product. There are some exciting times ahead for our team of passionate innovators and developers.Following Gavin’s update our Recollect Administrators took to the floor with some inspirational projects and uses of Recollect. They have kindly allowed us to share their projects with all of you, we think they are fantastic! The City of Sydney Archives is currently implementing Recollect. Their Collection dates from 1842 with the City Archives team established in 1976. The Collection includes 12,000 shelf metres of archives as well as digital records. The City Archives is also a collecting archive with high public interest in the collection. The City Archives has an active volunteer program that has been running for 20 years with volunteers providing item level descriptive metadata. They also have a well-funded programme for digitising high value records. Their Recollect site will enable access to their Collection, including allowing users to access and download digital objects when they exist. 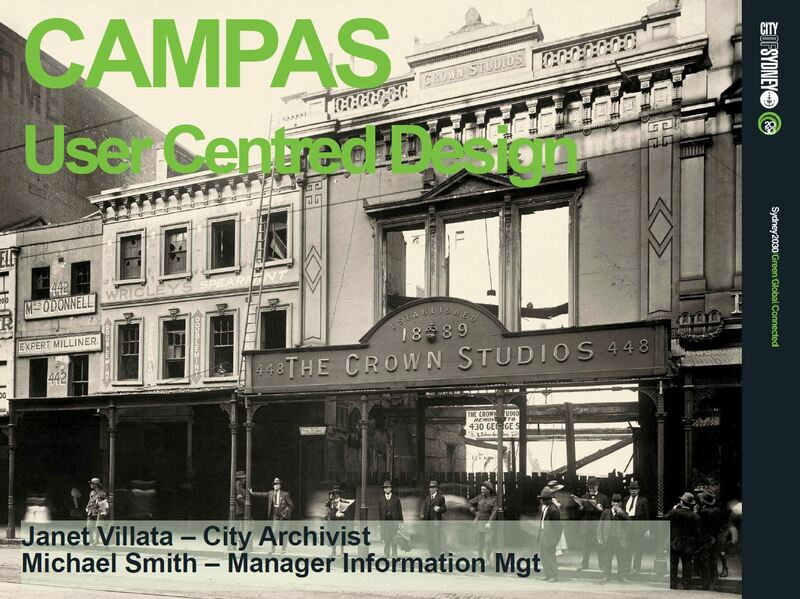 Michael Smith explained that currently the City Archives are “fairly impenetrable for users”. The City of Sydney website has 18 links from their home page with 16 options for searching the collection. The many systems that make up the archive all have different interfaces. This makes it incredibly hard for “newbies” to navigate and search.When preparing for a new system, thought went into identifying user needs and understanding how they would like to search the collection. Michael indicated that archivists tend to assume “We know who our users are and what they want” when in fact it is more a case of “we know who some of our users are and some of what they want”. During the implementation process for Recollect, the Discovery Workshops identified key information that will allow the site to be configured to suit the City’s Collection and how their diverse users want to access the Collection. 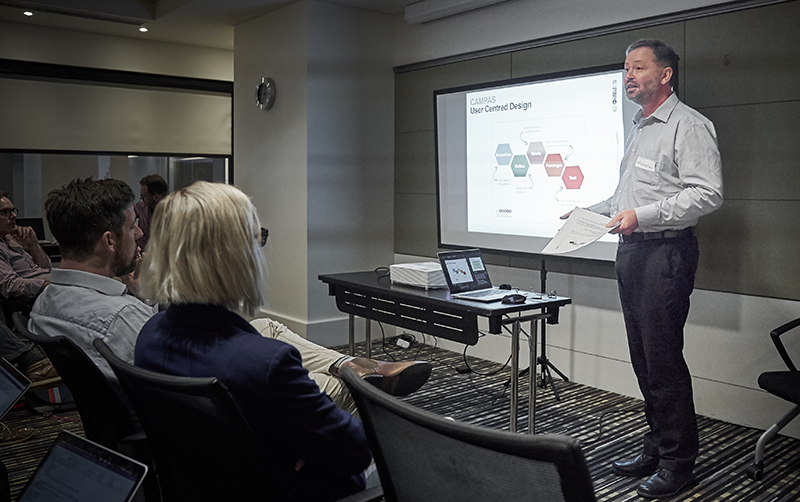 The Recollect Persona and User Experience Workshops were used to explore user requirements and make key decisions about configuring templates and search widgets. 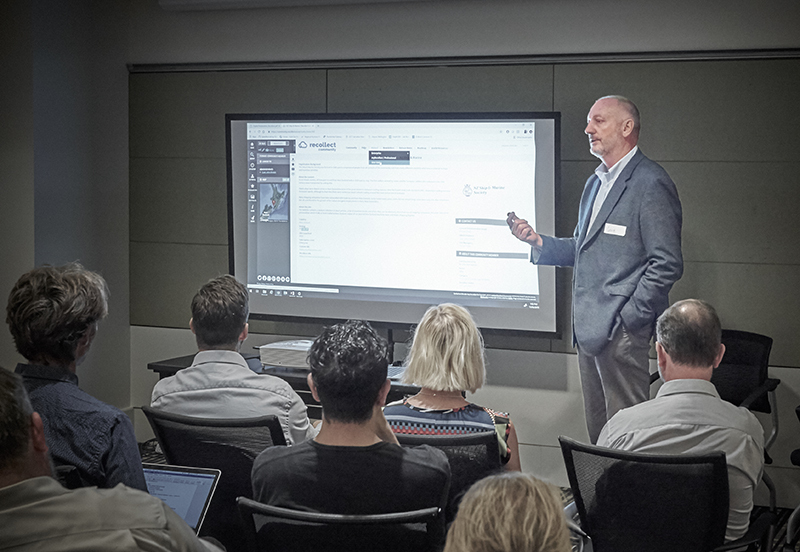 The Recollect Data Workshop focused on data migration and the metadata needed to ensure their archives are consistently searchable when uploaded into Recollect. Location Based User Experiences – a person walking down the street can look at the Recollect site and be shown items from where they are standing using their geo coordinates. Photos with richer metadata – record lat/long of where the photographer was standing, the direction they were facing and the coordinates of buildings in the images – this is starting to be worked on. Increasing Volunteer Activity – managing a larger team of volunteers working online, with some working remotely, to improve item level metadata. The City Archives Recollect site is due to launch later in 2019. 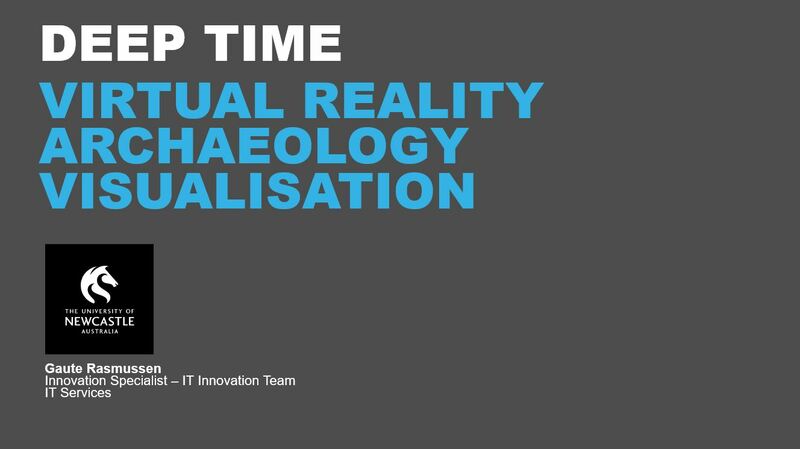 The Recollect platform has been used to facilitate the fascinating Virtual Reality project by UON ITS Innovation Team, Deep Time, Archaeology Visualisation.Gaute describes how their team get to “play with and develop some pretty awesome technology to enrich teaching and learning”. 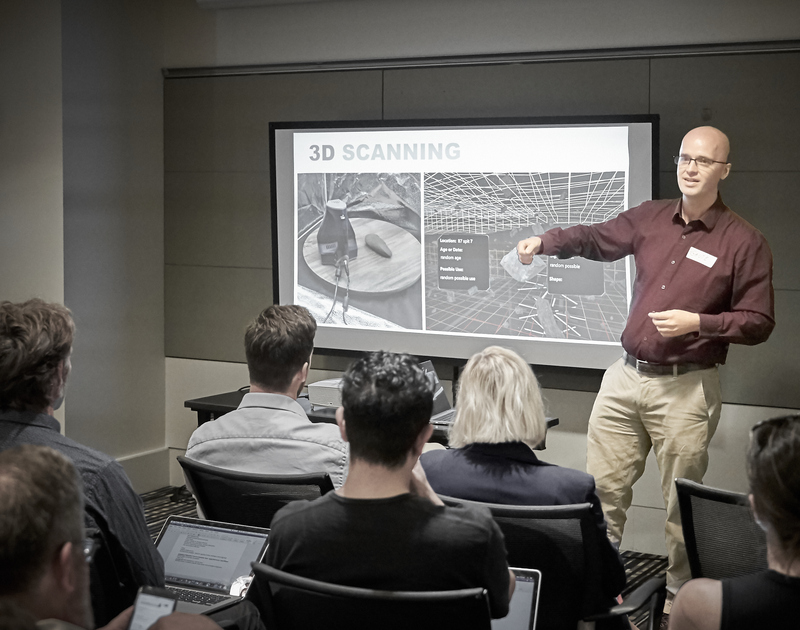 After an archaeological excavation was done in Newcastle, and over 5000 artefacts were uncovered, the UON ITS Innovation Team came in to see how they “could do something cool”. Their first idea was a VR replicated dig where people were interested in discovering the original context of the items. As excavation destroys the context of the artefacts, this VR technology will allow researchers to visually understand how the artefacts spatially relate to one another. Each item found within the site was 3D scanned and had recorded metadata of its discovered location ingested into Recollect. 3D files were uploaded to Recollect as an object file and texture file. This is where Recollect acted as the repository, as well as a place to look at a 3D object. Then the VR application was implemented with “The Trench” – a holographic trench modelled by hand, based on the archaeological report. 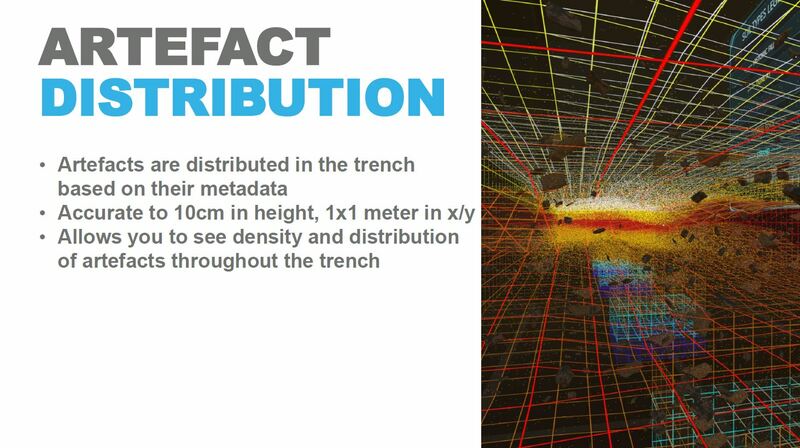 The artefacts were then distributed in the trench based on their metadata recorded within Recollect, allowing the viewer to see density and distribution of artefacts throughout the trench. Find out more about the Deep Time project here. Visit the UoN Recollect site Living Histories here. 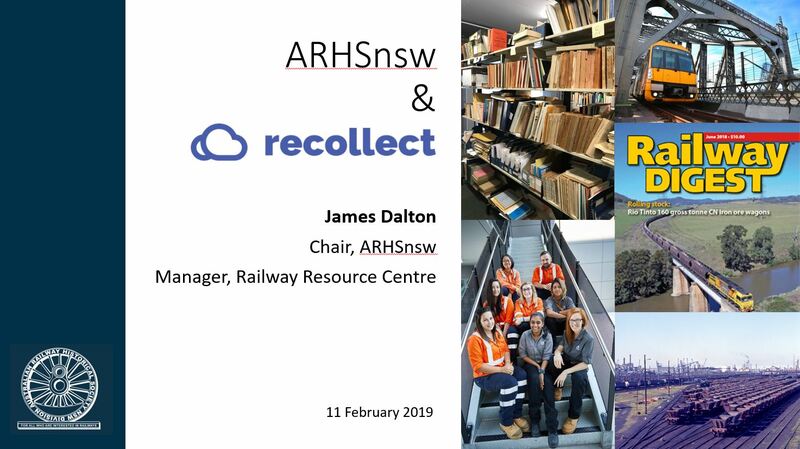 The ARHSnsw is a very enthusiastic community whose mission is to – “Be a focus for all who are interested in railways, particularly in NSW, through shared experiences, learnings and fellowship”. ARSHnsw are a not-for-profit society who maintains the largest private collection if railways of NSW, its people, infrastructure and operations by being a publisher, operating a bookshop and resource centre and operating rail-themed tours to help commercial and private interests with their research and / or in support of their hobby. However, to ensure they can provide these valuable services to the members of their community they need to make money through their archives. Previously their digitised material was uploaded to their intranet, which means that it is only accessible to the public by visiting their reading room. By implementing a Recollect site for their archives the Society will soon offer access to all their digitised material from anywhere. This is a benefit which strengthens their value proposition for current and prospective members. It will generate interest and grow an engaged community of railway and history enthusiasts and professionals. It also means staff and volunteers can spend more time focused on the maintenance and development of the collection rather than attending to minor enquiries. If you are interested in gaining access to the Railway Resource Centre please get in touch with James here. We want to say a big THANK YOU to these presenters for sharing their projects with us and the wider Recollect Community – we love seeing our product being used in such innovating ways to benefit all kinds of communities and collections for access, discoverability, engagement, preservation, management and learning. Want to find out more? Get in touch with our Recollect team today!